With my recent trip, Wandering leopard Pilgrimage 2017, there was one particular goal. While it was obvious that it was about F31s and the Hakone Leopard meeting… the underlying and main purpose of the trip was to meet the people. I went to Takamatsu and Yamaguchi because I wanted meet Satoshi and Junya. When Tsutomu and Shuichi said they would meet with me, I made it priority. When I was planning, I also made it a point to meet Arai and Nori. I went to Saitama to meet Yoshitaka… the list goes on. 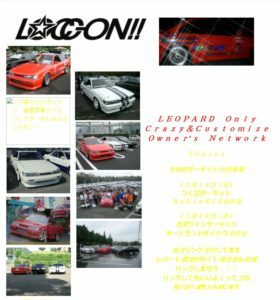 After last year’s leopard meeting, I was talking to a few leopard owners on facebook. I showed Makoto these emails and he gave me their facebook pages. Nori was already a friend, but we never talked and even at the Leopard meeting, we didn’t cross paths. I had sent a friend request to Arai, but he did not approve. So I sent him a message and that is when we started to talk! I showed him the old email and told him about my plan to go to Japan. He said he didn’t have his M30 anymore. I told him it doesn’t matter. I wanted to meet him. In the early 2000s, before facebook and instagram, many people made basic homepages and websites. There were free webpages such as geocities. What is interesting is that homepages were searchable regionally. You could search yahoo.com or webcrawler, but if you searched yahoo.co.jp, the results were different. Even to this day, Yahoo is dominant in Japan. This is how I made a ton of friends, not just in Japan, but in Taiwan, Hong Kong, Europe…etc. When we were building F31club.com, we didn’t have content. But the Japanese Leopard owners… they have been taking many pictures of their meetings since the mid to late 1990s. 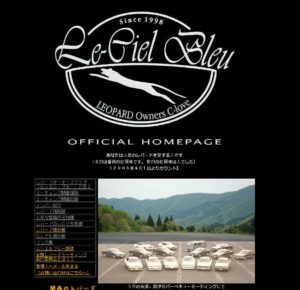 When many of us looked at leopard websites, many of these cars were iconic to us. We marveled at the aftermarket they had (obviously America heavily lacked EVERYTHING for the M30). Specialty had a couple websites as did Le Ciel Bleu. There were also many personal homepages and I emailed all of them. 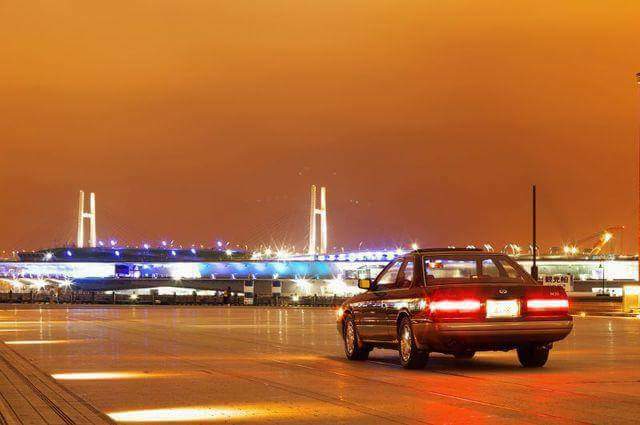 The first owner to contact us and actually linked f31club was Simasima. He had a white zenki with blue racing stripes. He loved muscle cars (I was told he owns a Dodge Viper now). I sent him an F31club sticker and he put it on his car. I was suppose to meet with him in 2007, but it fell through. During that time, I think the interest in F31s, whether it be leopard or M30, created some common ground. Kazuho (Le Ciel Bleu), and Satoshi registered on f31club.com. When we did decided to build F31club to a webpage, we needed that content and I remember I was coming up with banner ideas. We needed that one nice M30, that perfect shot of a clean M30. I had the perfect picture. This Black and Grey M30 in Japan. I wanted to use it because it was perfect. This was the picture we wanted to use for a banner. At the time, we did not know who’s it belonged to. Later, I would find out it is Arai’s M30. 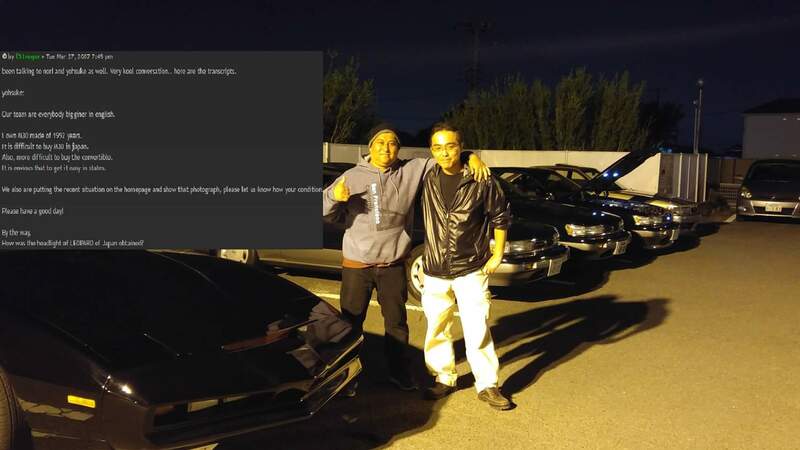 Jacy and I started to talk about it and we came to this conclusion that we needed OUR cars, because it would be taking “their” picture and using it for our purposes, but also it would also take away from f31club’s authenticity. We didn’t know who’s car it was and it was just saved from a homepage. At the time, we had a couple M30s that were clean enough to be banner material. 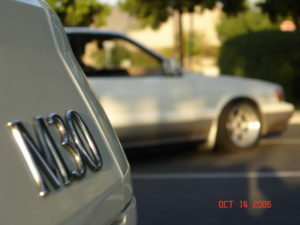 Naoki, Brian and Brandon had the slammed and clean M30s. Yotis also had an authentic leopard in Australia, but he didn’t give us more pictures. When we had the Nor Cal and So Cal meeting, we used those pictures as banner and website material. These were OUR cars and OUR content, making it authentic. This is what people wanted to see. Anyone can steal pictures of a website and use it, but with us, we wanted and needed original content. when Jacy and I met up. I was somewhat of an ambassador for F31club. Everyone knew I contacted them offline and on the phone. It is how we set up things and got personal. I would email all the Leopard owners and tried to bring them to f31club. 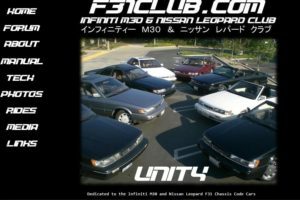 Since F31club was a forum, people were not familiar with it. 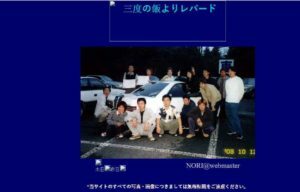 In Japan, many sites used guestbooks and bbs style forums. 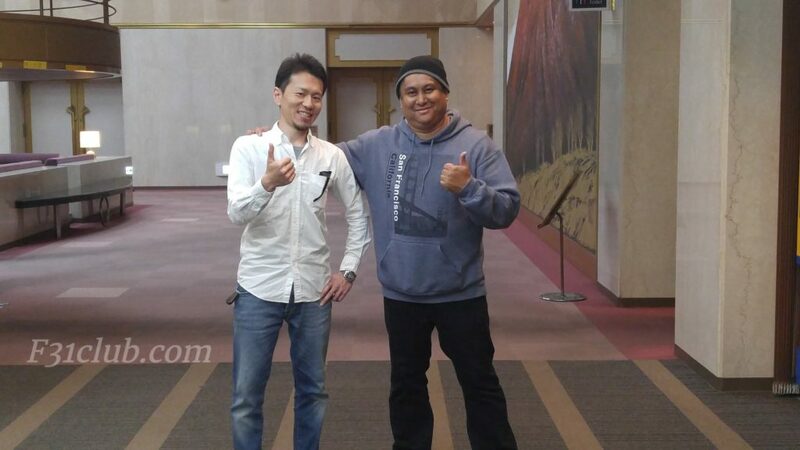 So when Kazuho mentioned I emailed him 10yrs ago, I was surprised. I was also surprised that Satoshi mentioned he was the one that contacted Jacy about the F31club stickers! After I came back from my recent trip, a few people mentioned and asked about “my connections“. Truth is, these connections were there a long time ago. I put the word out that I wanted to meet anyone that could meet me and I would go to their prefecture if they had time, even 30 minutes. So I was very happy that Nori, Arai and Kazuya met with me because we connected 10 years ago. I had to meet with Satoshi. He is on F31club as (S-T-S). Years ago, he contacted Jacy about getting f31club stickers and Jacy sent him the font. He rocks it on his M30 in Takamatsu! 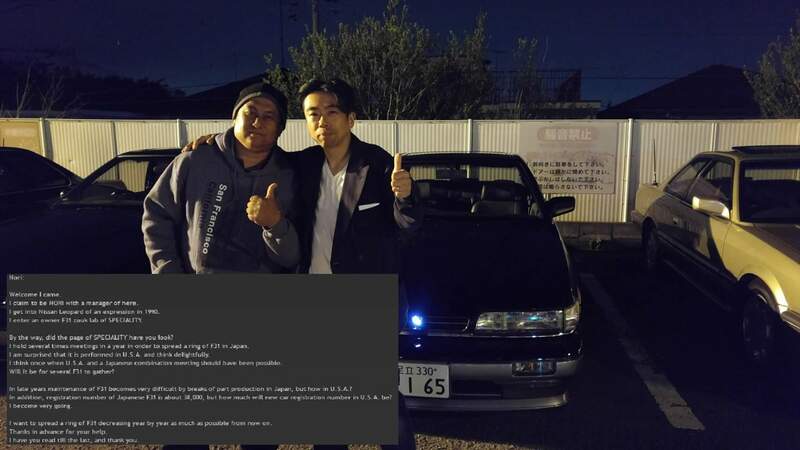 Not only has Satoshi been a good friend, but he was part of F31club years ago! This was in October 2016, a few days after the leopard meeting. 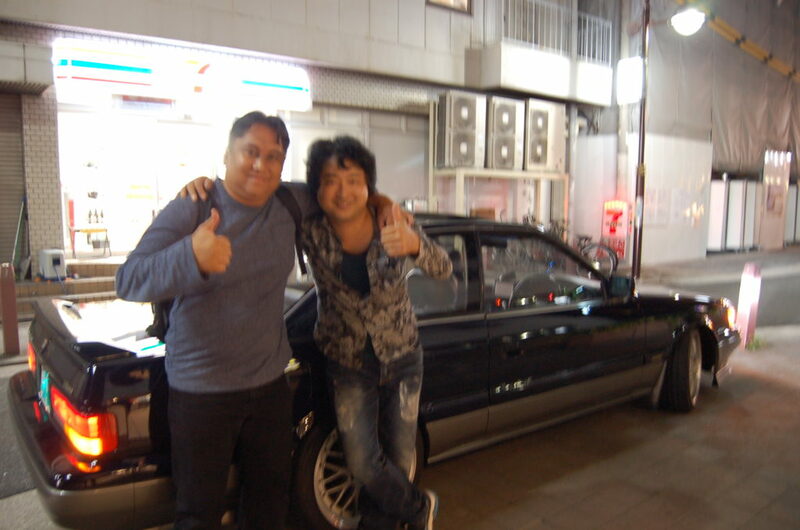 I was on Osaka and Kazuho said he could meet me. At the meeting, he approached me and said I emailed him 10 years ago. He also registered on f31club and gave some information. I was able to see his 2 leopards! Beyond just seeing the cars, it is actually meeting with these guys after all this time. It is reconnecting and having that common interest in the F31 that sparked our conversations 10 years. I’m only honored to meet with them and to even ride in their cars. Now these connections, they are lifetime! This entry was posted in blog, events, history, Meetings.